Between 50% and 75% of companies are missing their sales goals. Mike Lieberman, CEO and chief revenue scientist at Square 2, has the answer. The buyer journey has changed. With so much information now available to consumers, it’s no longer a linear, three-step process with a clearly defined beginning, middle and end. And if companies don’t align their sales, marketing and customer service execution with the current ways people buy, their revenue will suffer. Join Mike and his expert guest hosts as they explore the new Cyclonic Buyer Journey™ in a series of podcasts. As avid binge watchers, we aren’t going to make you wait a week in between each episode – that’s for network TV. Instead, enjoy all of season one at your pace. Change your thinking, change your approach and, most importantly, change your results. With 50% of companies habitually missing their sales targets, the world does need a better way to drive revenue. 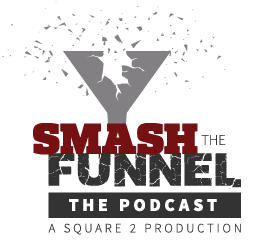 The first episode of Smash The Funnel – The Podcast introduces listeners to Eric Keiles, the entrepreneur-in-residence at Square 2 Marketing and co-author of Smash The Funnel – The Book. Eric will share why we need a new revenue methodology and why the buyer journey is so chaotic today. He’ll also help you understand why you’re not hitting your revenue goals every month. Episode 2:What The Heck Is Pre-Awareness? If you’re not actively trying to disrupt target prospects who don’t know you, you’re only executing a partial marketing effort. Join Sangram Vajre, co-founder at Terminus, to learn how you can operationalize outreach to targeted prospects who are not looking for you and leverage marketing tactics, analytics and software to drive new prospects into your revenue cycle. People are looking for businesses like yours right now, and they’re looking on the web. Join me and Franco Valentino, CEO of Narrative SEO, as we discuss the massive changes going on with search and Google. If your prospects can’t find you in search, your business is invisible. And with the changes related to how search works, this is a can’t-miss episode for everyone. Episode 4:What’s The Difference Between Awareness And Education? How Should Our Marketing Adjust? As we know, the buyer journey is chaotic and more complex than ever before. This episode features Matt Heinz, CEO of Heinz Marketing, talking about the differences between people who are reactive in the Awareness Stage and those proactively looking for education in the Education Stage. Matt gives insight into what prospects are thinking while educating themselves, how to create marketing to deliver education and what successful educational marketing campaigns look like. This episode features Sonja Jacob, content strategy team leader at Drift, the leading conversational marketing software company that provides chat tools to businesses. This episode shows you how to use new software tools to construct a buyer journey that is designed to get prospects information and engage with them quickly, accelerating sales cycles and increasing close rates. This is a must-listen episode for anyone in marketing or sales. This episode features Tyler Lessard, VP of marketing at Vidyard. The Evaluation Stage is one of the most important stages, and how you differentiate your company here can make or break sales. With most people preferring to watch rather than read, video is an increasingly critical tactic for sales, marketing and customer service. Learn how to add this to your tactical plan to drive better results. Your prospect is emotionally ready to buy, but you’re not done. You can still lose the deal. How your prospects rationalize their decisions is key, and you need to make it easy for them to get answers to every detailed-oriented question that comes up during this stage in their buyer journey. That’s why we’ve invited Kyle Racki, CEO at Proposify, to share his secrets on how to present your recommendations to clients, answer their final questions, and keep them feeling safe with you and your team. In this episode, we’re delighted to have Matt Sunshine, managing partner at LeadG2 and executive vice president of The Center for Sales Strategy. Some people consider this the most important stage, that key time when prospects sign the paperwork and you get to celebrate your new customer. But if you don’t handle this stage properly, you can still blow it. Matt shares his strategies to make this stage a non-issue, increasing your close rates dramatically. This episode includes a conversation with Jeanne Bliss, president of CustomerBliss and author of Would You Do That to Your Mother? : The ‘Make Mom Proud’ Standard for How to Treat Your Customers. If you don’t consider servicing customers as a revenue driver, you’d be wrong. With today’s transparent business culture, your customers are talking about you, posting reviews and sharing their experiences. If you’re not working hard to deliver a remarkable service experience, you’re shooting your revenue growth plans in the foot. Learn how to drive revenue growth through high-quality and remarkable service experiences. Our mission in season 1 of Smash The Funnel – The Podcast is to teach all of our listeners about the new buyer journey. We want you to understand how to apply tactics and metrics to that journey, and how to incorporate technology as well. In this final episode, we’re talking with Pete Caputa, CEO at Databox, about how to build dashboards for using metric and analytics at each stage of the new buyer journey. We discuss moving from tactical data review to stage data review, and we highlight the interesting insights that come with this switch. You’ll never think about data in the same way after joining us for this conversation with Pete. Ready To Smash The Funnel? Let us help you change your approach to marketing with a free 30-minute marketing assessment.